Uh, wasn’t this posted two days ago? I call that professional short term memory loss. my first thought: that looks like a buck converter minus the inductor. or a buck converter (~$1 ?) 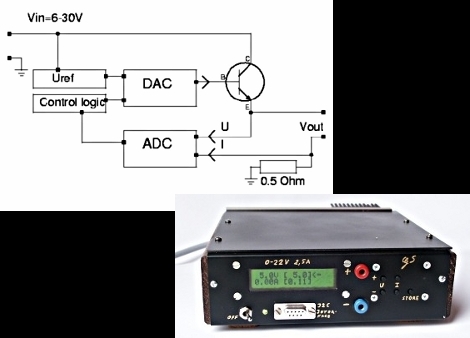 with the output connected to the transistor and an additional RC to ground with a time constant that matches the frequency of the pwm. I built a newer version of this power supply (that he sells the kit for online) a while back. It’s worked quite well and my multimeter shows that its voltage and current regulation is quite accurate. @tantris: no, it is a linear regulator just one that’s controlled by a microcontroller. It also has current feedback as opposed to a limiter, so I guess it could be programmed to do constant power which is something most professional bench PSUs can’t do. And it talks to a PC. I’m pretty sure this one appeared in Elektor mag not so long ago and they do a kit for it too. @nes: Look up what a linear regulator is. The feedback loop on this device is digital. And that is not the way to do a lab power supply. By the time the current limit kicks in, the circuit you are powering could already be fried. @uzerzero – please email me! I did the same thing. I did engineering for 6 months, switched to biology, just got my masters in molecular biology and now I’m half way through dental school. I’d love to hear your story! What I like most about this project is the case and display. gonna have to read more about this!